Clear food and beverage grade, wire-reinforced PVC hose. Air and water lines, light vacuum, mold machine water cooling, water soluble chemical spray. Our heavy-duty PVC spray hose is ideal for chemical applications with ratings of 600 psi to 800 psi. Shop chemical sprayer hoses today! Clearbraid hose is a common form of PVC hose that is used for its strength and temperature versatility. 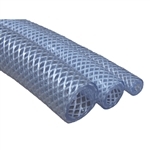 Reinforced by three polyester spirals, this hose is temperature resistant from 25F to 150F. Our Layflat PVC hose is reinforced with polyester fibers. 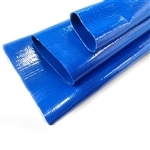 Great for water discharge, pools and sumps, our blue layflat hose is available in 300' rolls with various diameters. PVC hose and tubing are used in a wide range of industries. Because of PVC’s ability to maintain a lot of different consistencies, PVC hose comes in many different styles and is great for a number of different applications. It is great for general purpose hosing applications, such as air and water lines. Additionally, PVC is widely used in the food and beverage industry, in vacuum lines, and as evacuation hoses. At more dense compositions, PVC can be used as a pressurized spray hose as well. We stock an assortment of PVC hoses and tubing, including clear wire vacuum PVC hose, PVC general purpose air hose, heavy-duty PVC spray hose, clearbraid PVC hose and layflat hosing. Shop PVC hose with Hose and Fitting Supply today.